Presenting Six of the best American Muscle and American Classic Cars for sale here in the UK on ClassicCarsHq.co.uk. This Californian example of the beautiful Cadillac Coupe Deville looks as if it has just rolled of the set of a movie. 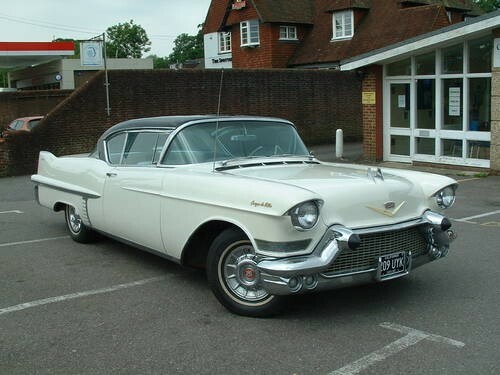 With black roof and stunning white body this much sort after American classic comes complete with all the modern luxuries such as six way adjustable seats, power windows and chrome buttons this Harley Earl designed classis could be yours for just £20,000. Check out the full Coupe Deville Ad HERE or browse for more classic Cadillac cars for sale HERE in the Classifieds. Also known as the Fireball 8 these straight 8 engine Buicks were some of the fastest cars of the day. This manual gearbox example has had a lot of restoration work and care over the years and is described as an honest and matching number example of these much sort after early Classic American muscle cars. 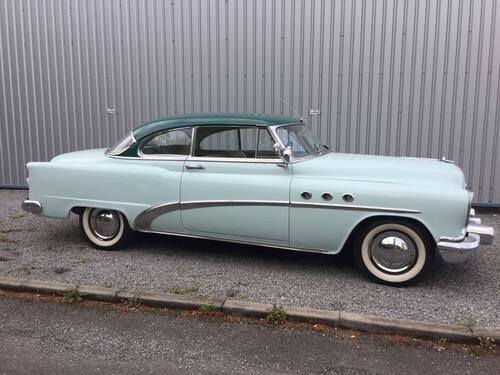 Own your own Buick Super Coupe for just £19K. Check out the full Buick Coupe ad HERE or browse through more classic Buick cars for sale Here in our Classifieds. A true American classic the Chevrolet C1 Corvette. 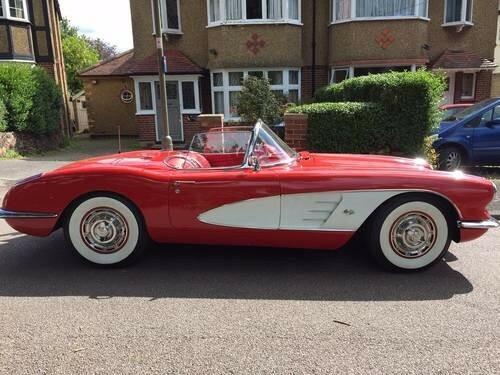 This stunning example is in two tone red and white and has been recently restored to a high standard throughout including a new cream soft top and original red hard top. The 245Cu inch engine is coupled to the much sort after manual gearbox and she also comes wrapped in new whitewall tyres ready for you to enjoy. Get your wallet out as shes not cheap but, good value at anything less than £77K. Check out the full C1 Corvette ad HERE or browse through more classic Chevrolet cars for sale Here in our Classifieds. 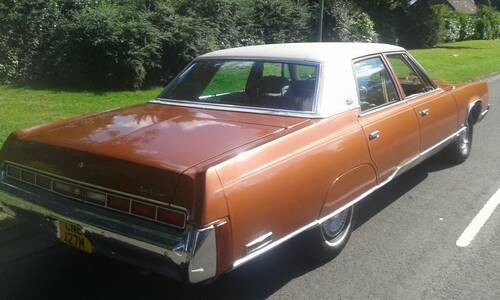 Not your typical classic American car but this Chrysler New Yorker from 1974 is certainly worth a look. The car come powered by the legendary 440rb Engine and is described as very original and not messed with. She also claims to have no rust nor dents. The interior has a front bench seat and so the car can seat 6 comfortably. Effortless power steering but a speedo with a mind of its own. Set in a brilliant burnt Orange with cream leather interior. Yours for just £11K. Check out the full Chrysler New Yorker ad HERE or browse through more classic Chrysler cars for sale Here in our Classifieds. Now this classic is what could be termed as a real American Muscle Car. The Dodge Charger was legendary in its day and still today for its high powered Hemi Engines. This 52 Hemi monster kicks out about 600BHP and comes with a Pro Street Semi Auto gearbox. She also has bigger headers and a ceramic coated exhaust from front to back. Sitting on American Racing wheels with BF Goodrich tyres all round shes ready to tear up the tarmac and could be sat on your drive for sale for just £75,000. 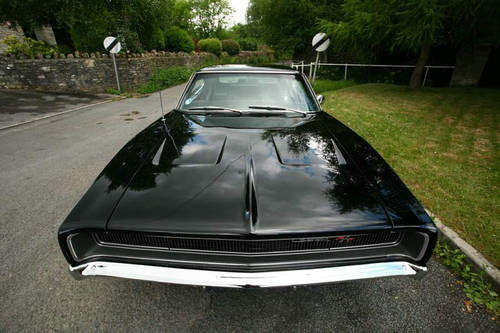 Check out the full Dodge Charger ad HERE or browse through more classic Dodge cars for sale Here in our Classifieds. 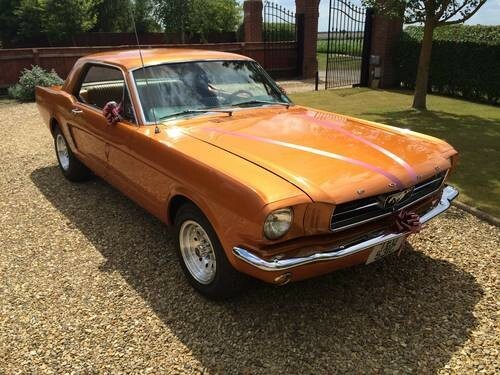 Check out the full Ford Mustang ad HERE or browse through more classic Ford cars for sale Here in our Classifieds. So there you have it readers, some of the best American Classic Cars on sale here in the UK today. Which one would you buy if you had the spare cash? Leave us your comments below.